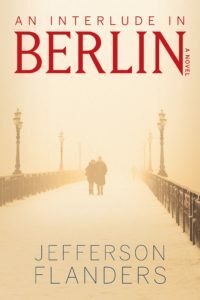 In January 1959, Dillon Randolph, a young Foreign Service officer, arrives at the U.S. Mission in Berlin hoping for a fresh start after a messy scandal at his last embassy posting. A Soviet ultimatum designed to force the Allies from the city and stop the flow of East Germans to the West has put Berliners on edge. When Dillon meets Christa Schiller, an actress from the famed Berliner Ensemble, their romance entangles him in a KGB plot designed to intensify the crisis. Dillon and Christa are plunged into the shadowy struggle between competing spy agencies where the innocent become bargaining chips in a game with life-and-death consequences. I envisioned An Interlude in Berlin as both a love story and a thriller. Over the past three years, I’ve spent some time in Berlin, learning as much as I could about the city and the very tense period in its history just before the Wall went up in 1961. Against this backdrop, I fashioned a novel about a romance between a young American diplomat and an East German actress. They are caught up in events beyond their control. I imagine things in visual terms (perhaps that’s why readers have told me they find my writing cinematic). When researching my books, I often turn to period photographs. I hope I’ve captured some of the Cold War tensions in Berlin at decade’s end, staying true to historical reality while also telling a story that will keep readers turning the pages.